Some people have an unparalleled knack for fitting in anywhere. Yet, far from merely blending into the scenery as another flower on the wallpaper, they join in, engage and make others feel like they’ve known them for five decades instead of five seconds. Even more intriguingly and via a quality that one can’t define as being either nature or nature in origin, other individuals possess "one of those faces" that works almost like a visual lie detector, making you want to confess, confide, or convey everything going on in your life with minimal prompting. Of course, each asset can be viewed as either a blessing and/or a curse as my mother is in possession of the latter and finds grocery checkout clerks, strangers at the mall, and countless others wanting to share their dramas with her as though she were either their free shrink or their fake one a la Loren Dean’s character in Lawrence Kasdan’s Mumford. However, if you happen to have both qualities along with a substantial amount of irresistible Irish charm and an eager wish for revenge against dangerous criminals akin to the IRA who murdered your daughter and ruined your marriage, then chances are you’ll want to put them to maximum use. And this is precisely the case for undercover cop Tommy Murphy in BBC’s underrated, engrossing series Murphy’s Law starring Waking Ned Devine, Millions and Lucky Break actor James Nesbitt. One of those rare performers fully in control of his emotional range as an actor, Nesbitt has the enviable ability to go from light to dark and all the colors in between as though it was as simple as flipping on a light-switch. Thus, it's no wonder that novelist Colin Bateman wrote the novel and later created the series version of Murphy’s Law specifically for Nesbitt. While you may also recognize the actor from varied work including Bourne Ultimatum director Paul Greengrass’ acclaimed Bloody Sunday, playing the detective out to catch Jonathan Rhys-Meyers in a smaller part in Woody Allen’s Match Point or in the beloved UK series Cold Feet, Nesbitt recently awed this reviewer with uncharacteristically anger fueled turn the little-seen IRA related Five Minutes of Heaven opposite Liam Neeson in a role that would surely have garnered him an Oscar nomination had more voters been made aware of it earlier. 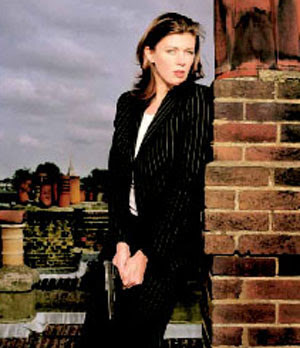 With the launch of 2003’s BBC series Murphy’s Law, which was transferred in late ’09 into a high quality 3-disc set containing the original five episode first series from Acorn Media, initially we find Nesbitt in his carefree Waking Ned Devine, Lucky Break and Cold Feet mode, making the most from the mischievous charm reflected in a sideways grin or an effortless twinkle in his eye. Yet given Tommy Murphy’s role as an undercover police officer who left the reminders of his horrific past in Ireland behind to successfully infiltrate crime syndicates operating in and around London, it isn’t too long before series creator and scribe Bateman remind us that even though charm is what got Murphy in the door, it’s the inner sense of rage and job-required ego that enables him to pull it all off from one episode to the next. Yet, instead of a Lethal Weapon showdown or buddy cop comedy dynamic (even though he will meet the woman who becomes his female partner as a result), we’re able to see the natural gift that Murphy/Nesbitt possesses as he rises in the ranks of an enterprising drug smuggling, racketeering mob to become the confidant and go-to man of the organization’s leader. But just when he’s ready to take down the group, Murphy’s cover is nearly blown twice-- first by the outside world when he encounters an old friend first as Tommy and then when he’s on the job and next when he learns that the beautiful “girlfriend” of the gang’s leader is actually fellow undercover cop, Annie Guthrie (Claudia Harrison). Along with our antihero, it turns out that Annie had absolutely no idea there was another double agent on the case. While normally this would be considered a plot spoiler, after the success of the pilot and thanks largely to the tangible sexual chemistry of our two leads, Murphy and Gurthrie begin collaborating on cases with her calling the shots as his new boss and also joining the game when it becomes apparent they work much better together. In terms of genre classification, Murphy's Law is definitely another UK crime series. However, the tone of Bateman's Law is on the whole far more engaging than some of the networks’ grittier fare. Or at least according to research, this was the case for the first few series until it adopted a more authentic and challenging approach complete with Cracker style three episode plot arcs as it continued on over the years. 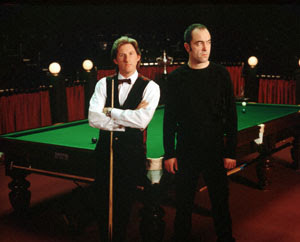 When viewers at last began seeing Nesbitt less as “the guy from Cold Feet” and more as someone who can immerse himself in the darkness of the job and the moral gray areas that crop up, the series took full advantage of it to deliver more complex mysteries. And sure enough, there are hints that the show is headed in this direction even as early as the second episode “Electric Bill,” which ends with an unsettling conclusion as Murphy goes undercover in prison to gain a confession from a British kidnapper only for a key member of the plot to vanish, undetected and unaware to anyone other than the audience in an eerie conclusion that will find the hairs on the back of your neck standing up. Like contemporary American shows such as Burn Notice and Leverage, at times Murphy’s Law does suffer from a pretty big suspension of disbelief issue concerning bad police work, logic gaps, the repeated need for us to buy into the idea that they never have to change locales and each week they can just become someone different, and that Murphy is always able to work his way in with less blood, sweat and tears than Leonardo DiCaprio had to use in Scorses's masterwork The Departed. Yet, like Burn and Leverage, the mixture of quality storytelling, quirky situations, humor, action, and pathos pays off well especially in odd situations including one wherein Murphy must figure out which woman is bedding and killing wealthy men who belong to an upscale health club. Captured in 16:9 widescreen complete with English subtitles, the set also contains the original stereo sound, which works just fine since the emphasis is on plot and character rather than action. 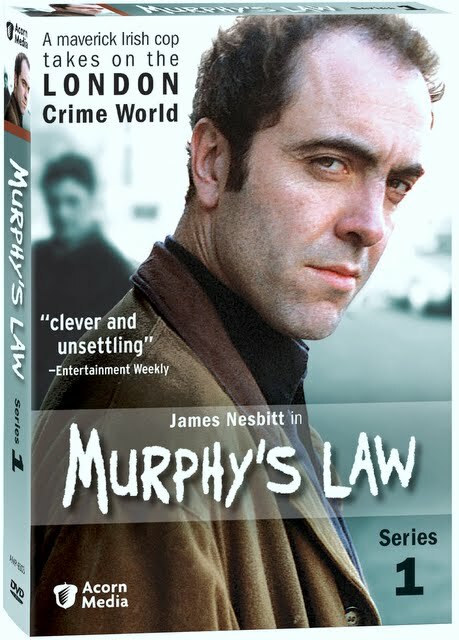 Overall, Law will make you anxious to see the rest of the series in broadcast order as Acorn releases it and reminds us once again just why James Nesbitt is one of Ireland’s greatest character actors. Moreover, he's one whom you truly believe could not only fit in anywhere but also (and far more dangerously), get you to tell him your secrets just with a single look of Irish eye-twinkling charm.